Dimensions 1.25 by 6 by 6 in. Prisoners; Legal status, laws, etc. ; Wales. Prisoners; Legal status, laws, etc. ; England. Amazon.com description: Product Description: This new, updated third edition of the popular Blackstone's Custody Officer's Manual provides a practical companion for trainee and established custody officers, containing all relevant legislation together with interpretations of the areas of the Codes of Practice that are most commonly misunderstood. It offers a comprehensive treatment of all the elements of the custody officer's role, highlighting common problem areas and offering practical guidance. Professionals involved in the criminal justice system will be acutely aware of the ever-changing legislation that governs the reception, treatment and welfare of people detained at police stations. This book aims to provide advice relating to all aspects of the detainees at police stations, and interprets the changes to the Police and Criminal Evidence Act 1984 and accompanying Codes of Practice. The new edition has been fully updated to include references to Guidance on the Safer Detention and Handling of Persons in Police Custody and the Terrorism Act 2007, as well as the 2008 revisions to the PACE Codes of Practices. Discussion of detainee's entitlements, reviews and relevant time, extending detention, identification and samples are all included and there is information on extending detention in terrorist cases. New cases, and further Home Office guidance, will also be added to ensure the book is fully up-to-date. This book provides advice relating to all aspects of the detainees at police stations. It should be seen as an essential reference material for future and existing custody officers, inspectors, and superintendents. The book will also be useful to training providers and to the private industry entering the criminal justice system in this area. 6 edition from Oxford Univ Pr (December 14, 2016); titled "Blackstone's Custody Officers' Manual"
5th edition from Oxford Univ Pr (January 21, 2014); titled "Blackstone's Custody Officers' Manual"
About: Blackstone's Custody Officers' Manual is an essential reference and training resource for all custody officers and trainers. 4th edition from Oxford Univ Pr (April 8, 2011); titled "Blackstone's Custody Officers' Manual"
About: The fourth edition of Blackstone's Custody Officer's Manual is an essential reference and training resource for all custody officers and trainers in England and Wales. 3 edition from Oxford Univ Pr (February 1, 2009); titled "Blackstone's Custody Officers' Manual"
About: This new, updated third edition of the popular Blackstone's Custody Officer's Manual provides a practical companion for trainee and established custody officers, containing all relevant legislation together with interpretations of the areas of the Codes of Practice that are most commonly misunderstood. 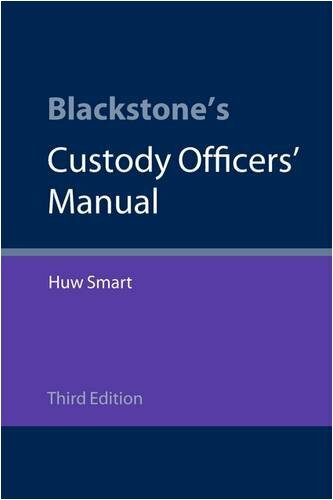 About: This new, updated 2nd edition of the popular Blackstone's Custody Officer's Manual provides a practical companion for trainee and established custody officers, containing all relevant legislation together with interpretations of the areas of Codes of Practice that are most commonly misunderstood. About: Designed to provide a practical companion for trainee and established custody officers, the Blackstone's Custody Officer's Manual contains all relevant legislation together with interpretations of the areas of the Codes of Practice that are most commonly misunderstood.